Launched in 1934, Vernon Kilns Early California dinnerware is characterized by two concentric rings and a zigzag moderne angular design. 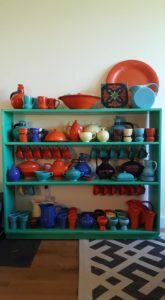 By 1937, glazes included: yellow, turquoise, green, brown, dark blue, light blue, ivory, orange (red) and pink. The company added maroon and white at some point, and the rarity of these colors makes them more desirable. By 1946, designers scaled back the available colors, producing pieces in blue, green, peach, turquoise and yellow. The line disappears from company price lists by 1950. The Early California line is on the “Montecito” shape, believed to be the first shape produced by Vernon Kilns (post-Poxon China). Throughout the dinnerware line’s comparatively long run, it went through several design style changes. Earlier handled pieces, such as cups and beverage servers, have an angled handle. In the late 1930s, possibly with the launch of Modern California in 1938, the line is rounded out with softer shape. At this point the color palette in Early California shifts as well, the bright, bold colors are toned down, and the high gloss light yellow and pink colors become more prominent. Vernon used the Montecito shape for dozens of different dinnerware lines until the company closed in 1958. Many lines, especially in the 1950s, often include a mix of pieces from Montecito, Ultra, and San Marino shapes. Montecito shapes were also adapted in the 1950s for the plaid and Brown Eyed Susan patterns. In this May 1937 advertisement from the Chicago department store, Marshall Fields, Early California, Organdie, and Harry Bird‘s Tahiti line are available – Tahiti prices are more than double Early California. Like many Vernon Kilns lines, Early California shares shapes with other dinnerware lines – in particular, the disk pitcher, tumblers and butter with Ultra California. 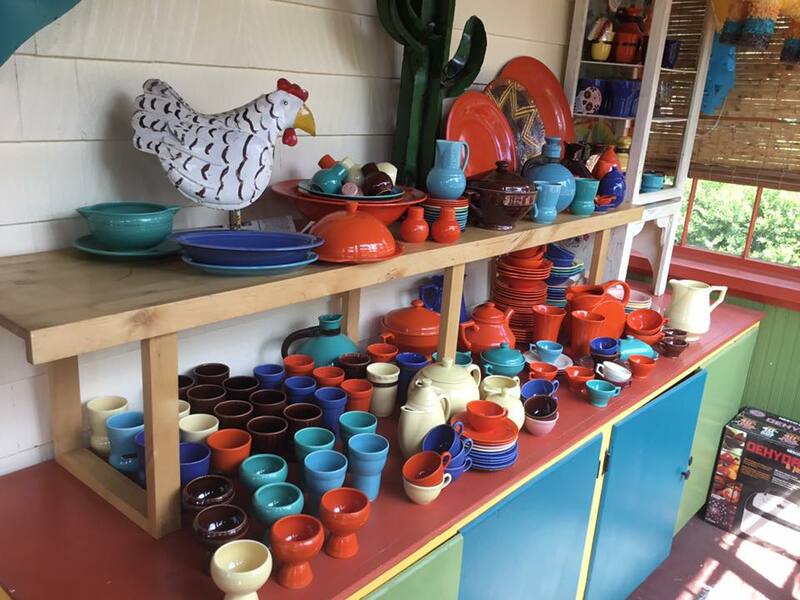 As Vernon Kiln’s longest running shape, the number of pieces available across all the dinnerware lines was considerable. Pieces available in Early California are noted. Platter, oval, extra large 16"